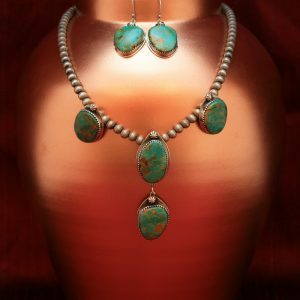 This classic Southwest style Native American necklace is handmade from turquoise and olive shell. The necklace consists of a long, single strand of hand drilled and polished Arizona turquoise nuggets strung with hand cut, drilled olivella shell heishi beads. This necklace measures 73.5cm in length and is finished with sterling silver cones and fasteners. It is skilfully handmade by Harvey and Janie Chavez of the Kewa Pueblo tribe. This classic Southwest style Native American necklace is handmade from turquoise and olive shell. 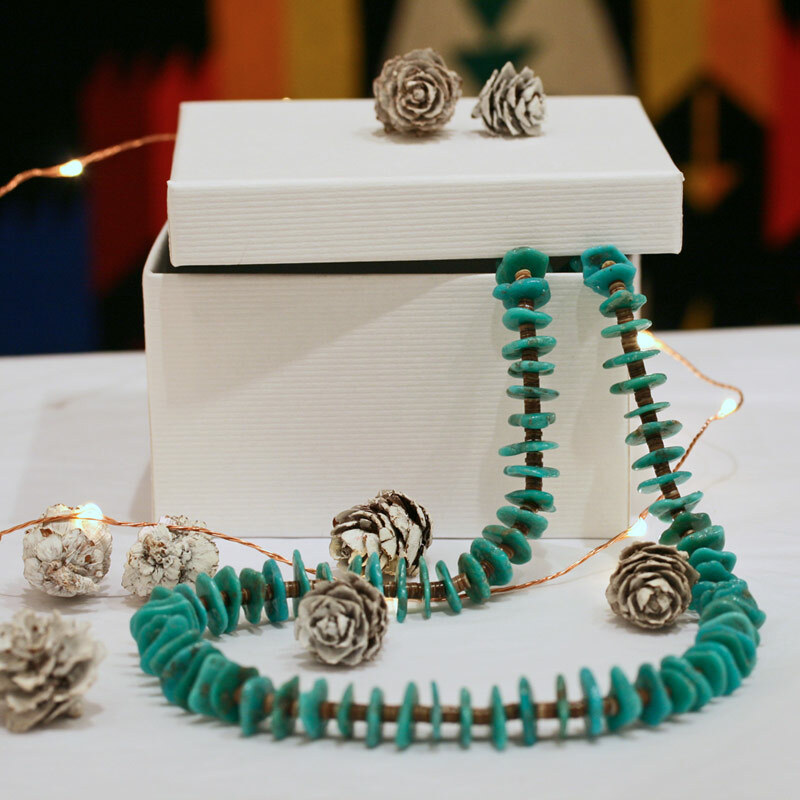 The necklace consists of hand drilled and polished Arizona turquoise nuggets strung with hand cut, drilled olivella shell heishi beads. This necklace measures 73.5cm in length and is finished with sterling silver cones and fasteners. It is skilfully handmade by Harvey and Janie Chavez of the Kewa Pueblo tribe. Harvey Chavez expertly handcrafts beads in the traditional way of his tribe. 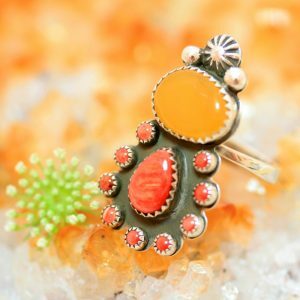 From tiny heishi or heishe beads to fine wafer cuts, every stone is individually hand cut, drilled and polished from natural materials such as turquoise, coral, pipestone, black jet, serpentine or shell. This once wide spread traditional skill is practised by fewer and fewer members of the tribe with each passing generation. Harvey and Janie Chavez are committed to practising the techniques learned from their parents, grandparents and great grandparents. They have passed these skills to their children and grandchildren in the hope that this knowledge will survive into future generations. Harvey’s finished beads are strung into infinite combinations by his wife Janie. 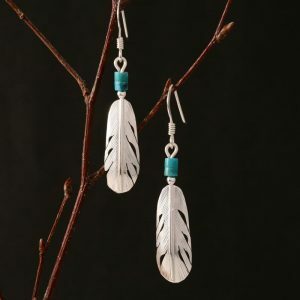 Janie makes necklaces, bracelets and earrings from the hand cut beads and hand formed feathers made by her husband. The Chavez family have been making jewellery for Rainmaker Gallery for over twenty five years. We are honoured to bring you the beautiful work of this talented family.